"What were trying to do is inspire and motivate Americans to move their bodies more," said Melissa Johnson, executive director of the council. The test involves three basic components: aerobic fitness, muscular strength and flexibility. The test is for people 18 and older who are in good health. It was inspired by scores of baby boomers who kept asking council members whether there was a fitness test available today that was similar to the ones they took as students, Johnson said. 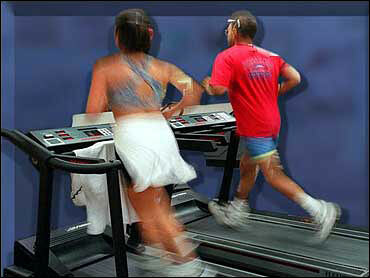 The aerobic component of the tests consists of a one-mile walk or 1.5-mile run. The run is not recommended for those who don't run for at least 20 minutes, three times a week. Push-ups and half sit-ups make up the strength test. The push-ups are done until failure. The sit-ups are done for one minute. A stretching exercise called the "sit-and-reach" is used to measure flexibility. The scores from all four of the fitness tests can be entered online. Other information, such as age, gender, height and weight are also part of the equation. You won't get a presidential certificate, but the results will then show where you rank among people of the same age. For example, if someone scores in the 75th percentile for push-ups, that means 75 percent of the scores fall below your score. The fitness test incorporates height and weight to give participants their body mass index. Generally, a BMI score above 25 equates to being overweight. However, for people who do exercise a lot, the BMI score can be high because of their extra muscle mass, not because they have too much fat. The test will allow people to easily record a baseline that they can work from through their exercise routine.